Progressives (aka liberals and Democrats) are bought off by radical Islamists and then claim they knew nothing of the backgrounds of their “hate America” supporters. For any politician, especially one as “savvy” and with as huge a taxpayer-funded supporting staff as that of Sen. Nelson, to come out and claim ignorance of their Islamic funders indicates the Senator’s disdain for the intelligence of the ordinary voter, as well as his disregard of our American Principles. If a sitting U.S. senator is actually that ignorant of the threat of radical Islam to this country, then it’s all over. To add insult, Nelson’s office issues a statement saying that “Sen. Nelson does not know Mr. Bedier [huh??? ], who made a relatively small contribution of $500”. [That’s right, he claims to NOT know the same Bedier who is prominently displayed in the photos speaking with Sen. Nelson and shaking his hands, and apparently emceeing the event as well.] The campaign returned Bedier’s check because it “learned of some highly controversial statements Bedier made about Israel” which disagree with Nelson’s views, the statement said. Big deal…the event reportedly raised some $50,000!!! 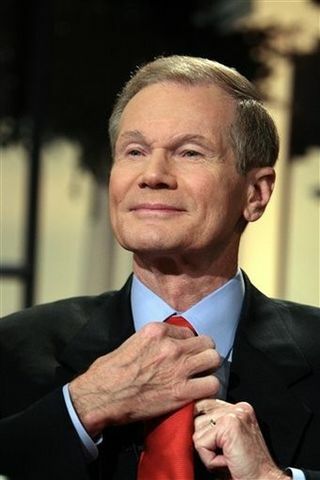 If you love America, and you are a friend of Israel – the U.S.’s only reliable democratic ally in this volatile region, then you can send Bill Nelson packing back to the Space Coast (and perhaps even into space) in November 2012. There need to be billboards that say: EVIL THRIVES WHEN GOOD MEN DO NOTHING. Still my friends say that they won’t talk about religion or politics. Who’s worried about making/keeping friends when FREEDOM is at stake. Some people have buried their heads in the sand and are voting as their parents did fifty years ago. Good bulletin board–ostrich with its head in the sand with the words: Is your head in the sand, or are you finding out the facts about Barack Obama’s background yet? What is he really doing to America? Why? God must impart WISDOM to the minds of many American citizens who no longer adhere to the words of the Bible unless they like them. As I just read, Billy Graham’s wife said that with a president who upholds gay marriage, God will have to apologize to Sodom and Gomorrah unless the same thing happens as a consequence. I wonder how many liberals even know what the story is about? The Muslims are mass producing. They are buying the hearts of disenchanted poor African Americans and teaching them to hate their country. This attitude of TOLERANCE has become so pervasive that I wonder how many people would bother to tell a neighbor or friend that they should worry. Now they throw rocks at Christians in THIS nation. Like World War II, we need to put them in camps until the terrorist threats are over. When an Army officer can commit mass murder while yelling the Muslim cry and get off on a psychological disorder, we are in for trouble unless we remove this president from office SOON. Impeachment would suit him since he isn’t an American citizen any way.